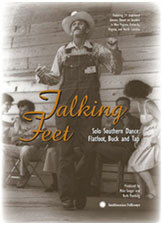 The first documentary about flatfoot, buck, hoedown, and rural tap dancing, the styles of solo Southern dancing which are a companion to traditional old-time music. Dances are done to hand-patting, talking blues, and singing, as well as old-time, bluegrass, and western swing-style music. Dancers range in age from 20 to 82. Featuring 24 traditional dancers filmed on location in WV, KY,VA, & NC.